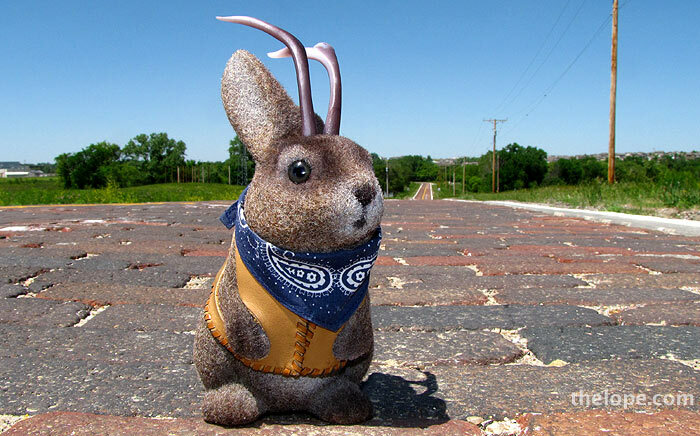 Why did the jackalope cross the road? Because it's made of brick and really cool. Where is Ace Jackalope? Hint: Ace wore a pin for a variation of this photo but we can't show it yet because it's a dead giveaway. But I will tell you the pin was bought at the Joliet Area Historical Museum and Route 66 Welcome Center in Illinois. I think Ace might be on the brick alignment of Route 66 near Auburn, IL. He looks happy. Rt66 near Auburn, IL? Good guess. Logical guess - But no. Think about where exactly that museum in Joliet is located. I'm stumped. Unless, of course, Ace is in the Joliet Area Historical Museum, standing in front of a picture of the Auburn brick road. ???? To get this one you have to think about the exact location of that museum in Joliet, and realize that because of this they wouldn't sell only Route 66 stuff. Cass street is the old Lincoln highway. The first cross country highway from New York to San Francisco. circa 1913. ie before Route 66! Yes, cumbres, it is. So, Route 66 isn't the only possibility.